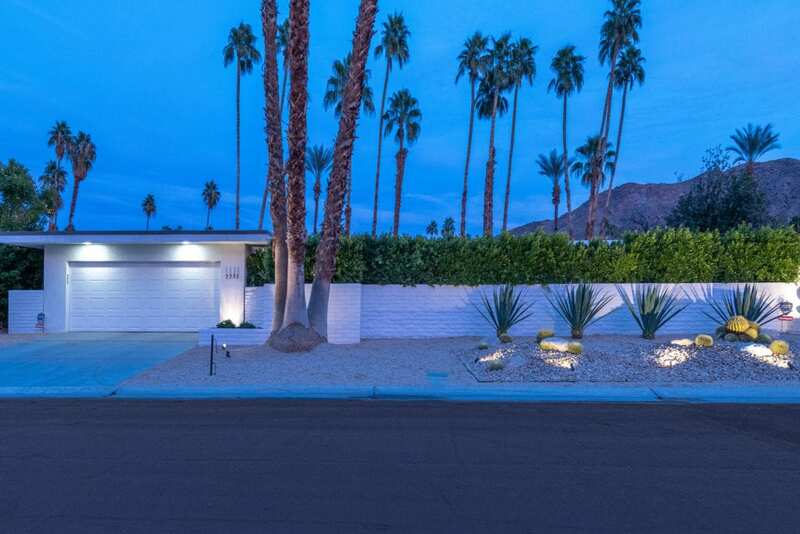 Indian Canyons is the location of this re-imagined 1965 Mid Century property in South Palm Springs. Western facing front loaded mid-century shaped pool and adjacent spa greet you as you walk through the gate to the spacious front yard. 2675 square feet with four bedrooms and 3 baths was meticulously remodeled in 2017 to include custom walnut cabinetry, quartz counter tops and thoughtful use of Heath tile. The master suite with views to the mountains to the East and adjacent golf course is replete with large bath with soaking tub, double sinks and large walk in closet. As people say “it’s what’s on the inside” and this house has been updated to include interior copper plumbing, sewer line lateral connection, electrical panel, Milgard dual pane windows and sliders and that is just a partial list. The open floor plan and rock fireplace combined with sliders and floor to ceiling windows in some areas create the perfect place to hang your hat or bathing suit.